You can make the white cake mix from scratch but I prefer to use Duncan Hines White Cake mix. It seems to raise much nicer. It is also alot easier. I use the Smucker’s strawberry jam because it is nice and thick and has a lot of fruit in it. The homemade pastry is the base of the tart so it should not be frozen or store bought. The first thing I make is the pastry. My Recipe for this is 5+1/2 cups all purpose flour. I use 1/4 cup of white sugar plus 1 teaspoon of salt, and blend it all together with the flour. Then I cut in 1 pound of lard into cubes and add to the flour. Make sure the Lard is blended well. This is the best time to make sure all the ingredients are blended because once you add the liquid the more you play with the dough the tougher it gets. Now for the liquid, 1 cup of water, 1 tablespoon of vinegar, and 1 egg. In this order and in the same container. Just blend this lightly. Pour it in the flour mixture and blend it all until it’s smooth. Flour surface and roll our dough. you will need muffin tins and the a round object to cut the dough to fit the size of the muffin tins.The pastry shell should reach the top of the muffin tin. 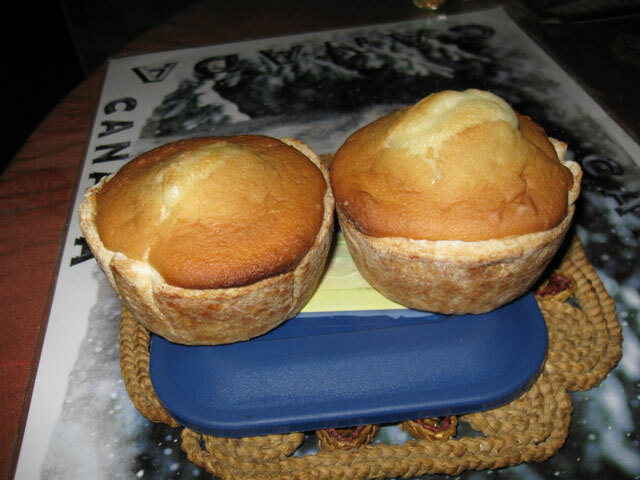 After the tart shells are placed in the muffin tins then it’s time to make your cake. What ever cake mix you decide to use Follow The Directions on the Package. Now that the cake mix is made Place the Jam approx. 1/3 the size of the tart shell. Then fill the rest of the shell with the cake mix. Bake at 350 until the cake turns golden brown. Please do not try to eat them for about 1 hour. The jam does’nt cool very fast.